Earlier this week my friend over at Doogs' Models vented a little, about the need to buy an airbrush. Before the week is complete I feel the need to vent as well, as always, in good fun. Imagine if I walked up to you empty handed and asked, "What do you think about this?" and then gave you a blank look until you you were forced to respond, "What do I think about what?" That would be annoying, right? 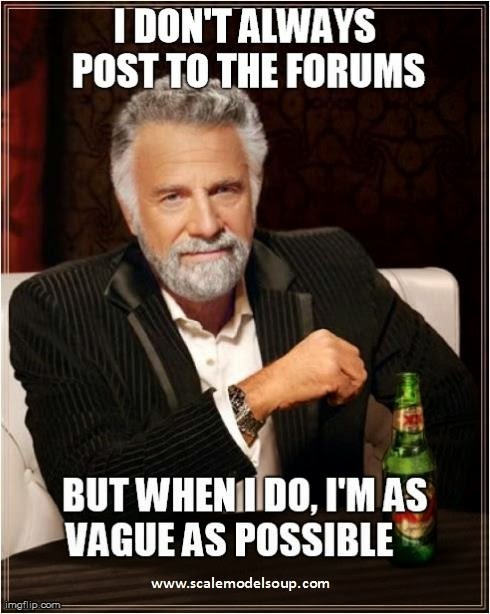 That's what a few of you are doing on the forums. As yet another sign that I'm getting increasingly crotchety as I get older, here's a collection of the most ambiguous subject lines I've noticed so far this year, with my sarcastic responses that I wouldn't dare post for realz. In need of some help Like how to write a clear subject line? Looking for advice Always make a list before going grocery shopping. Any plans for these? Do you mean my childhood hopes and dreams? Nope. Need help with my bad memory Try Gingko Biloba. Any thoughts on this vehicle? Yes. Is it true or a fantasy? If you're referring to my marriage to Kate Upton, it's pure fantasy...on her part. * Arguably the most ambiguous subject line one could ever use on the interwebz. And some people like to use ellipses, though not always correctly. I have a theory that these are Mad Men fans, aspiring copywriters trying to use a marketing ploy to entice us to click. Don Draper wannabes, you rock! Model shops in.... Antarcta? No, but a the rate Hobby Lobby is expanding, you never know. I wonder... Who wrote the book of love? The point I'm trying to make through this inept use of humor is, if you start discussions on the forums, please compose a descriptive subject line so we don't have to guess what you're asking about and be forced to click into a thread that we might not be able to contribute to. It's simply the polite thing to do. BTW, does anyone remember the name of that actor who was in that war movie with the fighting and guns? I agree! Thanks for the good laugh. I really want to use your Antarcta answer. So, if you see an "Ellispsiser" on your favorite modeling forum, chances are he was chatting online before the forum software you are using to post was even written as code for a webpage to use. If the pattern holds true,,,,,,the Ellispsiser might also still use note cards (and a pen!!!) to write a report, even though he types the report on a PC instead of a Typewriter these days. Good perspective, Rex. I used to participate on the old rec.models.scale usenet group. That feels like eons ago!